"Get To The River: What's Happening at the Jordan River Parkway?" The Jordan River is within a 10 minute drive to well over half of the population of Utah. Yet even while it is very close, it remains hidden, undiscovered and misunderstood to many. Learn about the projects, programs and partnerships that are developing to improve the Jordan River Parkway and make it more safe, healthy, beautiful and prosperous — an amazing natural asset for our region. 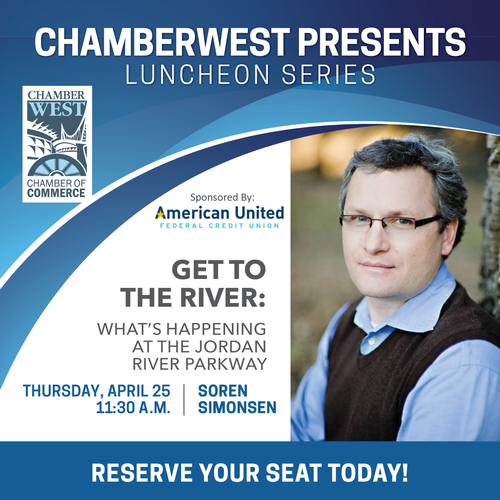 About the Speaker: Soren Simonsen is the Executive Director of the Jordan River Commission, a cooperative government agency he co-founded in 2010, and has directed since 2017. He is an urban planner, architect, educator, community-builder and social entrepreneur. Over the past three decades, including 18 years of public service as an appointed and elected official, he has worked to create livable, prosperous and resilient places in Utah and the West. $20 for ChamberWest Members with advance registration by April 23rd or $30 for non-members or for members after April 23rd.